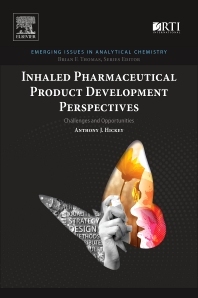 Inhaled Pharmaceutical Product Development Perspectives: Challenges and Opportunities describes methods and procedures for consideration when developing inhaled pharmaceuticals, while commenting on product development strategies and their suitability to support regulatory submission. It bridges the gap between the aspirations of scientists invested in new technology development and the requirements that must be met for any new product. The book brings together emerging analytical and inhalation technologies, providing perspectives that illuminate formulation and device design, development, regulatory compliance, and practice. Focusing on underlying scientific and technical principles known to be acceptable from the current regulatory perspective, this monograph will remain useful as a high-level guide to inhaled product development for the foreseeable future. Anthony J. Hickey, PhD, DSc, currently serves as a distinguished fellow and senior research pharmacologist at RTI International. He has more than 30 years of academic and research experience in the areas of pulmonary biology, aerosol physics, powder dynamics, pharmacokinetics and drug disposition, formulation design, and device development. His research has focused on improving understanding of the physiology, pharmacology, and immunology of the lungs. Throughout his career, Dr. Hickey has worked on intranasal and inhaled vaccine development and drug delivery for diseases affecting the respiratory tract, including asthma, chronic obstructive lung disease, tuberculosis, and cystic fibrosis. He has also studied the performance of powders and particles in drug and vaccine delivery systems. He received his PhD and DSc degrees in pharmaceutical sciences from the University of Aston in Birmingham, a master’s degree in toxicology from the University of Birmingham, and a bachelor’s degree in biology from Portsmouth Polytechnic.